Candy has a variety of whole ants and ant body parts. These are similar to size of our western harvester red ants and werey bred to be your snack and totally safe to consume! This looks like a real colony due to the ant farm design of the candy. Comes in a 2 pack of Cherry and Apple. 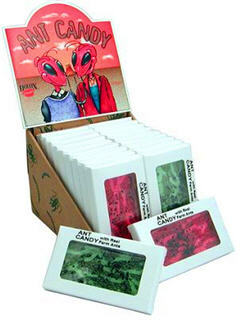 The HotLix clear hard candy is filled with once real live ants! Ants are the preferred food of the Anteater. Eat one and become an ant eater too! A great gift for anyone into jokes or gags and makes a great conversational piece or a snack on the road.